UPPER EAST SIDE — The team of conservators who helped restore the Obelisk in Central Park over the past two years has a bright idea for the ancient Egyptian monument's hieroglyphics — illuminate them at night. In a report prepared for the city last month, the conservators suggested that the Central Park Conservancy use high-definition projectors to cast images of the hieroglyphs back onto the Obelisk. By doing so, the conservators said, nocturnal visitors would have an opportunity to see what the images originally looked like when the obelisk was built 3,500 years ago. "If somebody decided to project hieroglyphics onto the sculpture, that would essentially create the true image of the Obelisk without any damage," Dr. Andrzej Dajnowski, the head conservator of the project, told DNAinfo New York. "Since it's just light, it would be very, very appropriate." Dajnowski said his son, who also worked on the monument's restoration, came up with the idea, but it's a special effect that's been tried out just a short distance away at the Metropolitan Museum of Art. The museum recently used projectors to digitally restore color to the carved reliefs on its Temple of Dendur. Dajnowski, 58, whose firm Conservation of Sculpture and Objects Studio is based out of Chicago, said the conservancy welcomed the use of a projector for the Obelisk, but money was an obstacle. "They said they liked the idea, but they need funding," Dajnowski recalled. He added that since the hieroglyphics were so worn that the conservancy would have to partner with an Egyptologist to determine what the original images looked like. 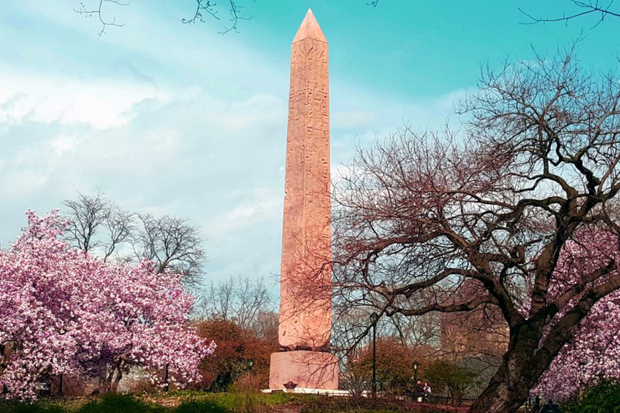 The Central Park Conservancy did not respond to a request for comment about the report and idea of projecting images onto the Obelisk, which is nicknamed Cleopatra's Needle. Dajnowski and his fellow preservationists gave New York's oldest public monument a $500,000 high-tech facelift from March 2014 to September 2015. Using powerful laser beams, they painstakingly cleaned off the grime on the Obelisk's 69-foot-high granite shaft and nearly 7-foot-tall base. A tiny section could take hours to scrub with the laser light, but Dajnowski said it was a labor of love. "Conservation in general is not a quick result field that gives you something huge completed in a day," Dajnowski said. "For me it was instant gratification and very rewarding that a square inch was cleaned as best as possible." His team also patched up cracks and lacquered patina on the bronze crabs along the base. The Obelisk, which, from a distance, looks like the Washington Monument's little sister, was built in the ancient Egyptian city of Heliopolis around 1450 B.C. to celebrate Pharoah Thumose III. The sleek, light-beige monolith was one of a pair. Each's pyramidal top was coated with precious metals, and their shafts were engraved with hieroglyphics honoring the Egyptian sun god Ra. For nearly 1,000 years, the two towered over the banks of the Nile River until the Persians invaded Heliopolis in 525 B.C. and toppled them. For the next 500 years, they laid in the sand collecting dust, but in 12 B.C. the Romans took them to Alexandria and erected them at a temple honoring Julius Caesar. In the late 1800s, when Egyptian artifacts had become a fascination of the West, Egypt gave one of the pair to London. And in 1879, the other was gifted to New York City. The monument made the 112-day journey across the Atlantic by boat. It was erected in 1881 at Greywackle Knoll, on the east side of Central Park, just west of the Met. While the restoration of the Obelisk was completed in September, the Central Park Conservancy submitted a final report on the preservation to the city's Public Design Commission last month. Aside from suggesting the use of high-definition projectors, the report said the preservation project helped solve an ancient mystery. Some conservators and historians had speculated that the Obelisk's base suffered fire damage when the Persian forces sacked Heliopolis. But when the conservancy tested samples of the Obelisk, it concluded that the fire hadn't damaged the monument. Rather the base's abrasions were due to lying in sand and being subjected to salt crystallization, according to the report. Dajnowski said he has worked in art conservation since he was 15, but the Obelisk was a rare treat because he was outdoors in Central Park each day. One surprise for him was the early morning visitors to the Obelisk who would pray and meditate at its base. "Who would think that people in New York City were praying to an Obelisk?" he said.